Acumatica, the fastest-growing provider of cloud-based business management software, enables small and midsized businesses to unlock their full potential and drive growth. You can take control of your business with a fully integrated ERP solution that aligns all the areas of your business under one roof. Your finance department, operations, sales, and warehouse employees will all be on the same page and be utilizing the same central system.  Why does Acumatica stand out from other ERP systems? Acumatica's modern design was built for the Cloud and continues to innovate rapidly. Flexible licensing and deployment options that can meet companies of all sizes and budgets. Accessible from anywhere, on any device, and any operating System – Apple, Android, Windows, all play nice with Acumatica. Consumption-based pricing and unlimited users mean you only pay for what you need and can add users any time without paying a fee. Financials (PDF) - Financial Management suite to streamline operations, real-time visibility with personalized dashboards, and the ability to manage multiple entities. Distribution (PDF) - Distribution Management suite to gain real-time visibility into available inventory, inventory in transit, and costs. Determine profitability by warehouse, location, product line, or business unit. Set rules for drop shipments, returns, and credit limits. CRM (PDF) - Customer Relationship Management suite, fully integrated with your ERP. Lead and opportunity management, quoting, sales and delivery, post-sales support and customer service all in one place. Sales dashboards and an add-in for Microsoft Outlook make this a great tool. Project Accounting (PDF) - Project Accounting suite to track all project-related costs, inventory, time sheets, billing rates based on the type of work, revenue based on percentage complete, and profitability comparison of budgeted versus actual. There are additional Acuamtica software Editions tailored by industry for Manufacturing, Field Service, and eCommerce. SaaS - annual software subscription on a public cloud. All infrastructure and upgrades are handled by Acumatica. Private Cloud Subscription - hosted in a private cloud with a hosting provider that you choose, or on-premises, and manage all software upgrades. Perpetual (purchase) - the more traditional method of outright buying the software and installing on-premises or hosting it in a private cloud of your choice. There will be an annual maintenance fee with this deployment option, which provides upgrade rights to new software versions. We’ve been helping small and midsize businesses through the process of upgrading their accounting software for nearly 30 years. Contact us at any time to learn more about the advantages of cloud-based business software and to see if Acumatica is the right fit for your business.